I watched as his little toes peeked over the concrete edge of the swimming lanes. His instructor was in the pool, arms outstretched—her rhinestone baseball cap blinging in the summer sun. “C’mon, Finn you can do it!” she encouraged. I’m not sure who was holding their breath tighter, me or him, but with a massive splash he jumped into the water and promptly started sinking to the bottom, arms flailing and legs struggling. After a second or two, the top of his head reached the surface and his arms started in earnest, first the right one with a semi-decent stroke, little fingers pulling at the water. Then the left one followed with a half-hearted effort, slapping the water instead of pulling. Then came the legs. He couldn’t decide whether to kick or do frog legs, so it was a combination of both—neither of which was very effective. I stood at the side of the pool completely panicked as I watched him struggle and flap and make almost no progress. Six weeks of swim lessons and THIS is what I get?! The wall seemed a mile away, and there was my son looking like an awkward dancer at the senior prom—arms protruding, legs bouncing in no particular rhythm. I thought: Isn’t she going to DO something? But she just stood there in the water encouraging him and smiling in her cute little rhinestone cap. Just when I thought I was going to have to jump in the water and rescue him, I said to her (in my most polite mommy freak out voice) “Is he okay?” Her reply changed my life forever. Pause, and breathe that in for a moment. To her, it didn’t matter whether his strokes were graceful or his legs powerful. She knew that the most important thing was to find the air. The sleek skillfulness would come later, but none of that mattered without the air—and he knew where to find it. Just at that moment, his little mouth bounded out of the water, and he took the biggest gulp of air imaginable. It wasn’t a polite “this will do” gulp. It was a life-saving grab of every morsel of oxygen available before he plunged back under the water and started his tadpole routine again — wiggling and writhing inch by inch. He would find the air two more times before he reached the wall – his swim instructor smiling molar to molar the entire time. We all struggle in our daily “swim.” We rise early in the morning after a night of lackluster sleep to make a breakfast that may or may not get eaten. We realize 15 minutes too late that the Paw Patrol shirt we promised would be clean never made it from the washer to the dryer at midnight the night before when we were finishing our last load of laundry. Lunchboxes consist of a string cheese and fruit chews because the cold cuts were out of date and the bread had too much fuzz to pick off. Of course we forgot that we were supposed to bring homemade muffins to the playdate today and we are out of flour and why are you crying and no you can’t have a lollipop for breakfast and where are the overdue library books and yes, we are out of toilet paper, so just use a tissue and don’t stick that in your nose, and I’ll find your fuzzy puppy in a minute and I CAN’T BREATHE! These strokes are not the graceful kind. The truth is, they may never be perfect and flowing. But they don’t have to be as long as we know where to find the air. 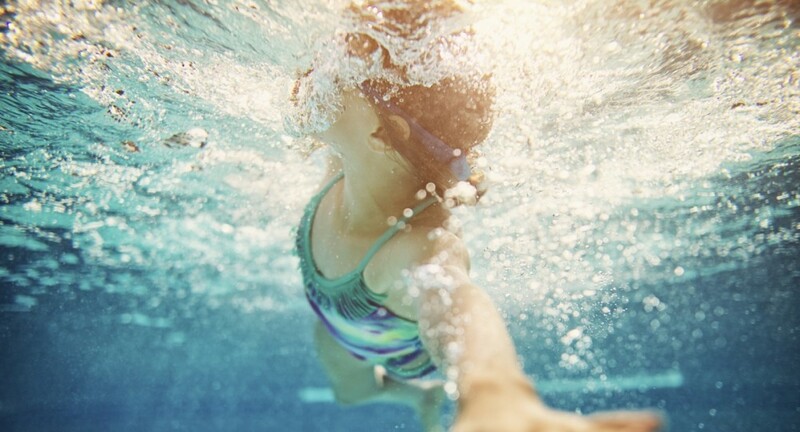 After that day at the pool, I started to focus more on what activities provide me with life-giving breath and less on making my daily grind look so perfect. I just had to shift my perspective. Maybe I didn’t have to make the teacher a dozen hand-decorated cookies with her monogram piped on with frosting. Perhaps a heartfelt note of gratitude went just as far, and isn’t writing one of the places I find my air? What if I skipped the ten part craft project with my toddler that was supposed to yield me a lovely forever keepsake and just snuggled on the couch while we read books instead? That looks like some air to me. Instead of concocting the perfect Pinterest picnic for the beach, could I just take a breath while my toddler buried my toes in the sand? Sometimes I look like an Olympic swimmer (those days are few and far between), but mostly I’m just flapping and flailing, barely keeping myself afloat and people are probably standing around asking, “Is she okay?” That’s when I know it’s time for some air. It’s important to note that my little guy knew several different ways to take that gulp. He could lean his head straight up to breathe, roll his head to the side while he was swimming or just flip over and float for a while when he got tired. It’s nice to know we have options. Sometimes I need a quick breath, like quiet time with a great cup of coffee or listening to a story on my favorite radio station. Sometimes I need some oxygen on the run without stopping my routine, like a prayer in the car for the patience not to throw a sippy cup at someone or an epic game of hide and go seek at the playground that yields enough giggles and hugs fill me up. And then there’s the restful kind of air that can only come when we lay prone and let the yuck of the world drain off of us. While we all covet the third one, if we learn to find air in different places, we can keep progressing ever so slowly toward the wall. When the waters seem insurmountable and the distance too far, we may have to call our own “swim coach”—someone who is in the water with us. Someone we trust to see our mistakes and struggles or who delights in us when our fingers reach the side of the pool. It’s the friend whose house you stop by in your pajamas for a cup of coffee, or the person you share your most awful mommy moments with. (You know, the ones you pray your children won’t repeat at school.) If we forget to take a breath, our coach will be there encouraging us, reminding us that it’s time to expand those lungs. And I took a moment right there to stop and inhale.